Underneath the Lilacs—For Memorial Day. A dirt mound topped by an urn. A simple memorial built with their own hands. This is what the farmers of Hartford, New York could afford to memorialize their sons who did not come home from the Civil War. Across the street is only Civil War recruitment building still standing in New York; stepping into the street and snapping a photo would still take you back to 1860s and 70s. It is much unchanged today, in the gentle, rolling hills near where I live, just a hundred and fifty miles south of the Canadian border. Except for the ‘Stars and Bars’ snapping profanely and contemptuously in the breeze down the road. The holiday we now know as Memorial Day started in 1968 as ‘Decoration Day’, when a general order was issued designating May 30, 1868, “for the purpose of strewing with flowers or otherwise decorating the graves of comrades who died in defense of their country during the late rebellion.” When Congress passed a law formally recognizing the last Monday in May as the day of national celebration, we effectively got our three-day weekend and our de facto beginning of summer. 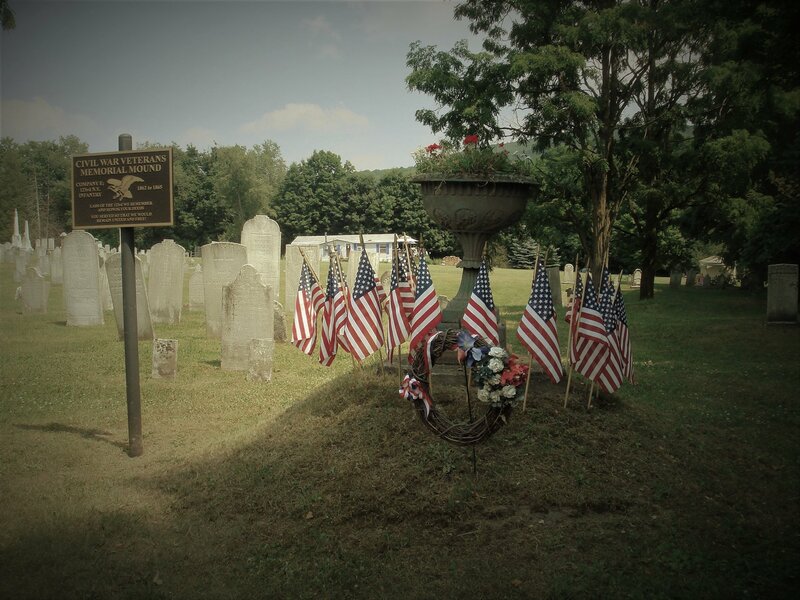 One of the most pleasant holidays of the year was Memorial Day, universally known then as Decoration Day because it was the day when you went out to the cemetery and decorated graves. 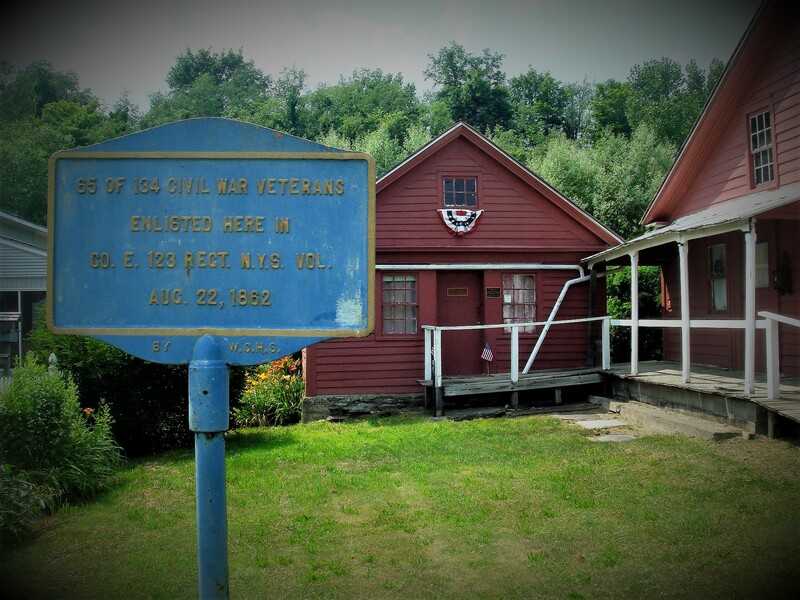 This day, of course, belonged to the Civil War veterans, although as years passed, it more and more became a day to put flowers on the grave of any loved one who had died, and when it came, just about everyone in town went to the cemetery with a basket of lilacs. Lilacs grow like weeds in our part of the country, and most farmers planted a long row of lilacs as windbreaks around their houses; in town, almost every house had lilacs in the yard, and in late May, the scent of them lay on the breeze. To this day, I never see lilac blossoms without remembering those Decoration Day observances of long ago. The Civil War veterans were men set apart. On formal occasions, they wore blue uniforms with brass buttons and black campaign hats, by the time I knew them, most had long gray beards, and whatever they may have been as young men they had an unassuming natural dignity in old age. They were pillars, not so much of the church (although most of them were devout communicants) as of the community; the keepers of its patriotic traditions, the living embodiment, so to speak, of what it most deeply believed about the nation’s greatness and high destiny. They gave an especial flavor to the life of the village. Years ago they had marched thousands of miles to legendary battlefields, and although they had lived half a century since then in our quiet backwater all anyone ever thought of was that they had once gone to the ends of the earth and seen beyond the farthest horizon. There was something faintly pathetic about these lonely old men who lived so completely in the past that they had come to see the war of their youth as a kind of lost golden age, but as small boys, we never saw the pathos. 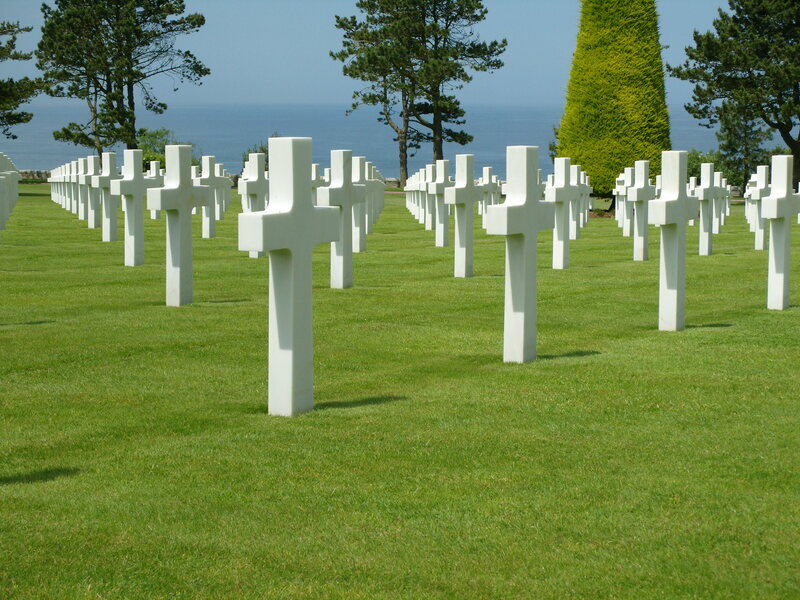 We looked at these men in blue, existing in pensioned security, honored and respected by all, moving past the mounded graves with their little flags and their heaps of lilacs, and we were in awe of them. Those terrible names out of the history books – Gettysburg, Shiloh, Stone’s River, Cold Harbor – came alive through these men. They had been there. And now they stood by the G.A.R. monument in the cemetery and listened to the orations and the prayers and the patriotic songs, and to watch them was to be deeply moved. The G.A.R., of course, was the Grand Army of the Republic, the veterans’ organization of those days. The Benzonia [Michigan] local of this organization was officially the E. P. Case Post Number 372, and it had been named for Edward Payson Case, a Benzonia man who died in 1886, a year before the post was organized. He must have been quite a man; he had enlisted in 1864, in the artillery, and his unit had been sent to Cumberland Gap on garrison duty and had finished out the war there, never getting into combat. Almost to a man, our G.A.R. 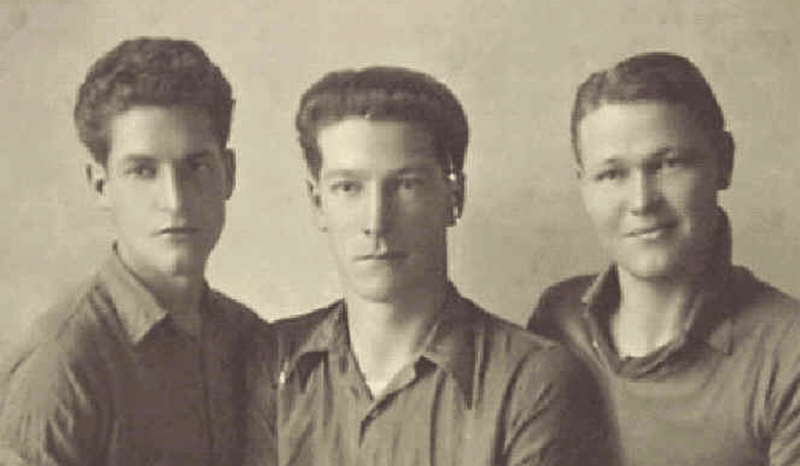 members had been in violent action during the war, and they never would have named the local post after a noncombat soldier if he had not been an impressive sort of person. The monument they built, sometime in the late 1880s or early 1890s, was completely homemade. It was a fat column of field stone and mortar, no more than four or five feet tall, capped by a round slab of rock that was just a little wider than the supporting column; it looks like an overgrown toadstool, and it would be funny if it were not so unmistakably the work of men who were determined to have a monument and built one with their own hands because they could not pay for a professional job. The spirit that built it redeems it; it stands today as the most eloquent, heart-warming Civil War memorial I ever saw. I remember the G.A.R. men as a group, rather than as individuals, although a few do stand out. There was Elihu Linkletter, a retired minister when I knew him, who had lost his left arm in the Wilderness. I never looked at him without thinking (in bemused small-boy fashion) how proud he must be to carry this visible sign of his sacrifice for all to see. Mr. Linkletter was devoted to birds, and he waged unceasing war on red squirrels because they robbed birds’ nests and ate fledglings. He used to tramp about with a .22 rifle, shooting every red squirrel he saw; he could use it one-handed and he was a remarkably good marksman with it. There was John Van Deman, who once told me how he had been wounded in some battle in West Virginia; like all the other veterans he pronounced “wounded” to rhyme with “sounded,” which somehow made it more impressive. There was Lyman Judson, who had served in the cavalry under Phil Sheridan and who had been invalided out of the service when, his horse being shot out from under him, he had fallen heavily on the base of his spine so that he suffered thereafter from a weak back. Forty-five years later, in Benzonia, he slipped on the ice and again fell heavily on the base of his spine. In some unaccountable way, this cured him, and for the rest of his life, his back was as sound and as pain-free as anyone’s. Then, finally, there was John Morrow, who had been an infantryman in an Ohio regiment and who had once exchanged words with General William T. Sherman himself. (“Exchanged” probably is not the word, because Sherman did all of the talking.) Anyway, during the Atlanta campaign Morrow and some comrades were out on patrol, and they came to a stream where there was a grassy bank with trees to cast a pleasant shade, and the day was mortally hot, and so they all stacked arms and stretched out for a breather. Just then, Sherman and some of his staff rode up, and Sherman came over to find out what these soldiers were doing. When he found out, as Morrow remembered it, he “used language that would make a mule driver blush” and in no time, the boys were back on patrol in the hot sun. They did not hold this against General Sherman, figuring that it was just part of the fortunes of war. By the time I knew them, these veterans were in their seventies, or very close to it, and a hale and hearty lot they were. There was one man, whose name I do not remember, who lived on a farm a few miles south of town. He had fought at Gettysburg, and in 1913, there was a big fiftieth-anniversary celebration of that battle, with surviving veterans invited to attend. This old chap went to Gettysburg, enjoyed the three days’ activities, and then came home by train, and when he finished the trip, at Beulah, he found that the friend who was to have met him with a buggy to drive him out to his farm had somehow failed to make it. Quite undaunted, the seventy-year-old veteran picked up his carpetbag and hiked the five miles home. He could see nothing remarkable in this because he had had many worse hikes during the war. In their final years, the G.A.R. men quietly faded away. Their story had been told and retold, affectionate tolerance was beginning to take the place of respectful awe, and in Europe, there was a new war that by its sheer incomprehensible magnitude seemed to dwarf that earlier war we knew so well. One by one, the old men went up to that sun-swept hilltop to sleep beneath the lilacs, and as they departed, we began to lose more than we knew we were losing. For these old soldiers, simply by existing, had unfailingly expressed the faith we lived by; not merely a faith learned in church, but something that shaped us as we grew up. We could hardly have put it into words, and it would not have occurred to us to try, but we oriented our lives to it, and if disorientation lay ahead of us, it would come very hard. It was a faith in the continuity of human experience, in the progress of the nation toward an ideal, in the ability of men to come triumphantly through any challenge. That faith lived, and we lived by it. Now it is under the lilacs. Excerpt from Catton, Bruce. Bruce Catton’s America. New Word City, Inc., 2017. 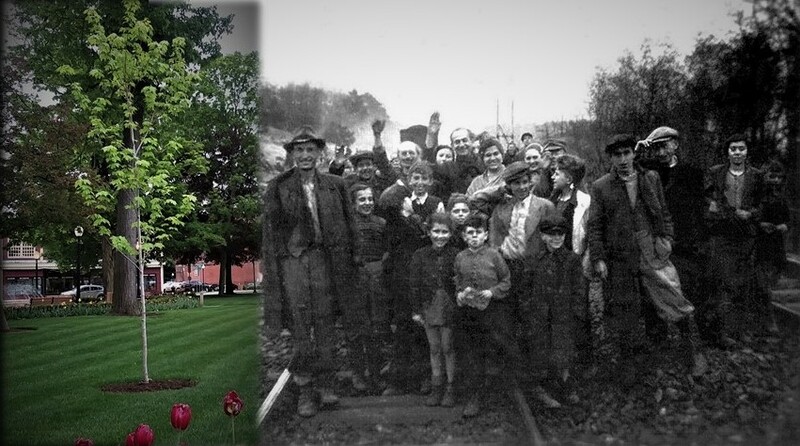 My tree in my hometown of Hudson Falls NY, 2018, and some of the just-liberated survivors of the ‘Train near Magdeburg’ on Friday, April 13, 1945, Farsleben, Nazi Germany. Sgt. George C. Gross photo. I recently got a late-night email from a friend whose father I wrote about in my first book on the War in the Pacific. I met Ron when he emailed to say that he often thought of my own father, his high school history teacher, class of 1965. It was in my dad’s class that he and a friend made plans to join the Marines, where they would wind up in combat in Vietnam. Ron’s dad had been a survivor of the infamous Bataan Death March, and a prisoner of the Japanese for three and a half years. As a result, he was bedridden by the time Ron reached his teens. He died as Ron started high school. Fifty years later, I wrote about his dad; the book has been a best seller in World War II circles. Over the course of writing another four (and counting) books profiling the men and women who fought in World War II, or survived the Holocaust, I have heard similar statements, most from people who I never even met. And the comments, really I suppose the catharses, always move me, especially when I think of where, and how, it all started. When I was a kid, I rose early on summer mornings to get out of the house at 2 Main Street before the rest of my four siblings got up. The subliminal goal was to have some time to myself, to explore the village where I was about to awaken to so much history. I walked uptown past the new ‘savings & loan’ on the corner of the block, past the stately brick mansion where General Lafayette himself lunched after the Revolution he helped to save fifty years before was being fought in the vicinity. So here, along the banks of the meandering Hudson River, I was heading to while away the summer morning in search of old bottle dumps and buried treasures from the Revolution and colonial wars that raged through two hundred years ago. I continued past Fielder’s Drug Store and Carleton’s Funeral Home, past the august old high school that now served as the place where we ‘southies’ attended our sixth grade before moving up to the new junior high school. I walked past the New Deal post office with its earthy WPA murals of local scenes of the river industries, logging and paper making, Depression-era farmers in blue overalls coming into town. 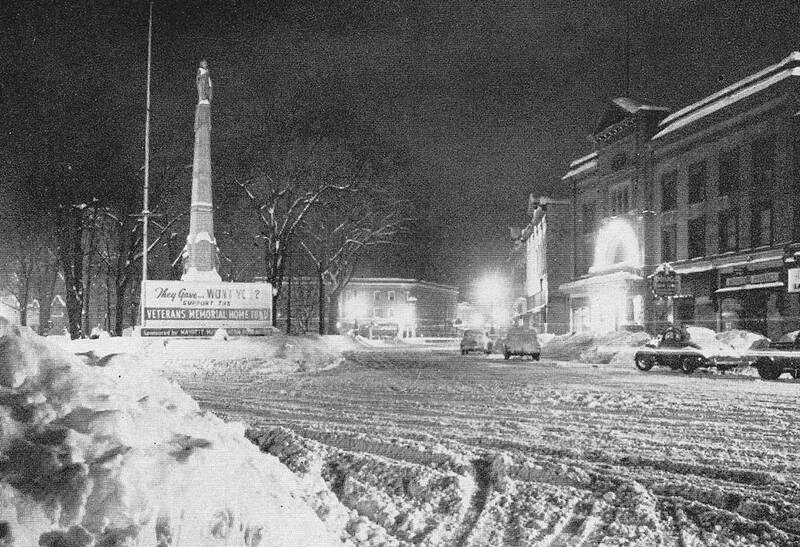 The churches were now in sight, as was the turn-of-the-century county courthouse on the corner. Crossing Maple Street, I was in the heart of the business district, full of former hotels and more family drugstores and businesses. 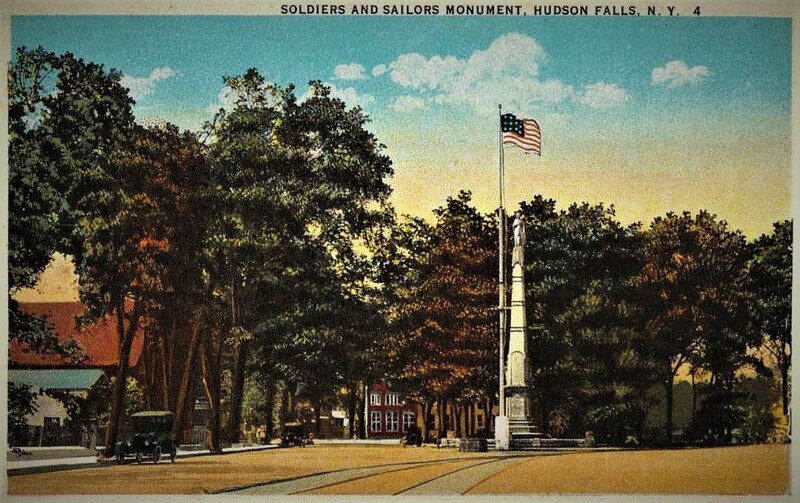 Soldiers Monument, Hudson Falls, on the Hudson River, in 1946. 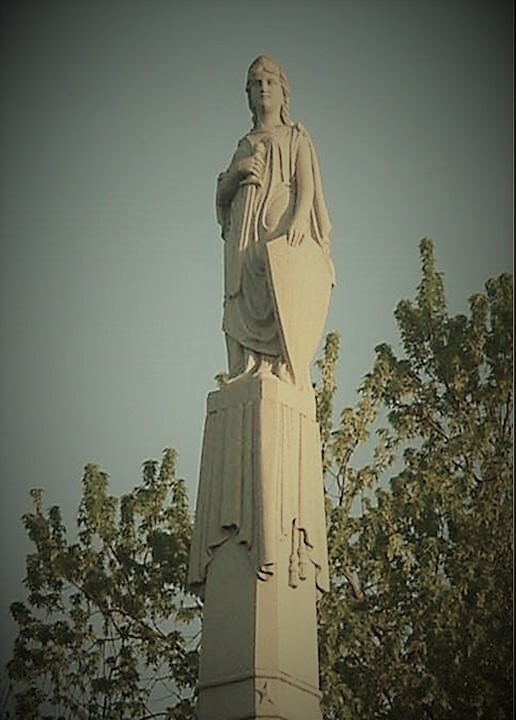 And looming at the head of the village park was Miss Columbia atop the Civil War Soldiers Monument, who with her drawn sword and battle shield struck a commanding posture that seemed to say, ‘Go ahead. Make my day’. I’d oblige the old girl in a few years as a mid-teen, a brush that involved my first and last tastes of whiskey from the bottle and a rude late-night attempt to scale her. When I awoke the next morning (to my horrified stupefaction, in my mother’s bed), I think Miss Columbia cracked a stony smile from her perch a mile away. A youthful indiscretion, a painful lesson learned. This teen burned with shame, but he would make amends someday, and somehow Miss Columbia knew that. 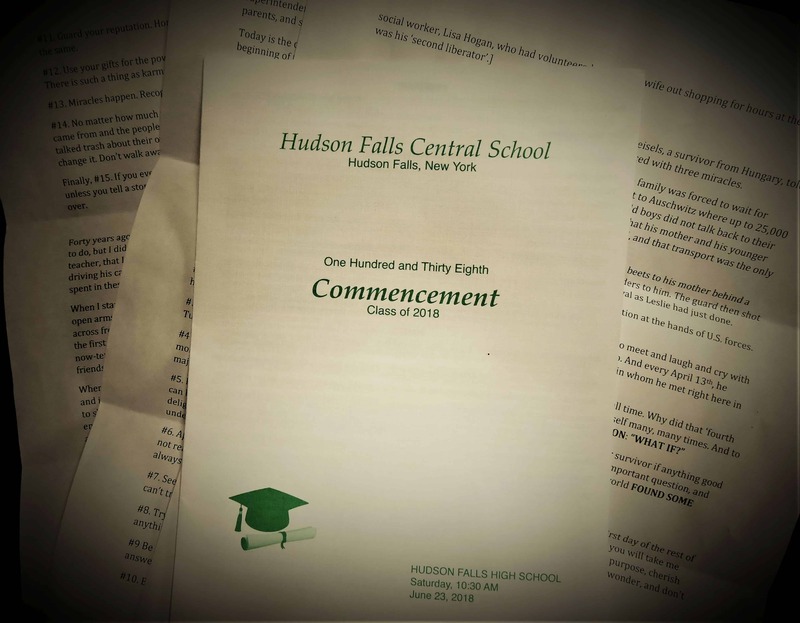 By 1979 when I graduated from Hudson Falls High School, I had also acquired the teenage itch to leave for the greener pastures of higher education. In conversation with my father as a senior in high school, I responded to his questions about my plans with the timeless wisdom and wit of the eighteen-year old—‘I’m leaving this town, I don’t know what I want to do, but I do know I am NOT going to become a teacher, like you’—a passing shot before I headed off to college a few hundred miles away. Take that, old man. But, touché. He had the last laugh, because at 26, I was now paying him a token in rent and driving his old car around town. And I became a teacher, a high school teacher like him, and wait—oh, yes—teaching the exact same subject that he had been teaching for thirty years, high school history. Even the young can’t outrun the karmic wheel. But then, maybe there was a higher purpose in coming home to serve my community that I could not begin to understand yet. You see, if I had not returned, a lot of very cool things would not have happened, and it’s times like these that I have to just stop and think about that. I was a young teacher, but soon enough I began casting pebbles. 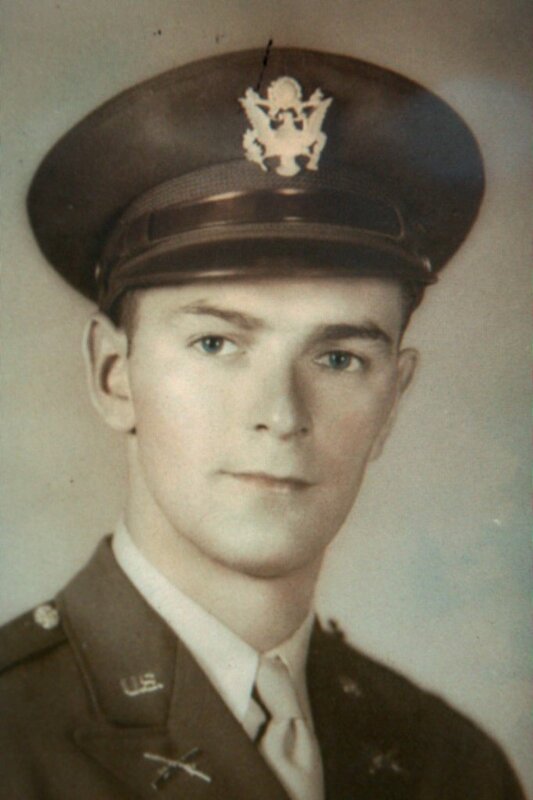 I began to interview World War II veterans when they were still ‘a dime a dozen’, drawing their stories out, following leads, and putting my own students on the hunt for a good story. It took a bit of time and an almost obsessive dedication. But thank goodness I did that, as an adult coming of age, back in my hometown. Dedicated to the honor and patriotism of the soldiers of Washington County who served in our war to suppress the southern rebellion of 1861, waged against the life of the nation. A little boy in the 1920s walks the streets of this town with his grandfather, hand in hand. They near the Soldiers Monument erected in the 1880s to remember the young men of the community who fell in the Civil War. The old man stops, points, and wipes his eye, proclaiming bitterly to the youngster that ‘there stands nothing but a tribute to Southern marksmanship’. Here is the young kid who would go on to pilot dozens of harrowing combat missions in World War II, the little boy holding the hand of his aged grandfather who had fought at terrible places like Gettysburg two generations earlier. In shaking Judge John Leary’s hand, eighty years on, I am suddenly conscious that I am now physically connected to the sixteen-year-old boy from our town who fought in the furious action at the turning point of the Civil War. So there it was. This is what Miss Columbia wanted me to find out, to try to understand. [i] We had come full circle, I supposed. But not quite yet. For it was also in this time that I sat down with another veteran here in my hometown as he recounted his Army travails as a combat tank soldier across northern Europe into Germany. I took the time to talk to Judge Carrol Walsh, and somehow the universe tilted just long enough for a crack to be opened across time and space. 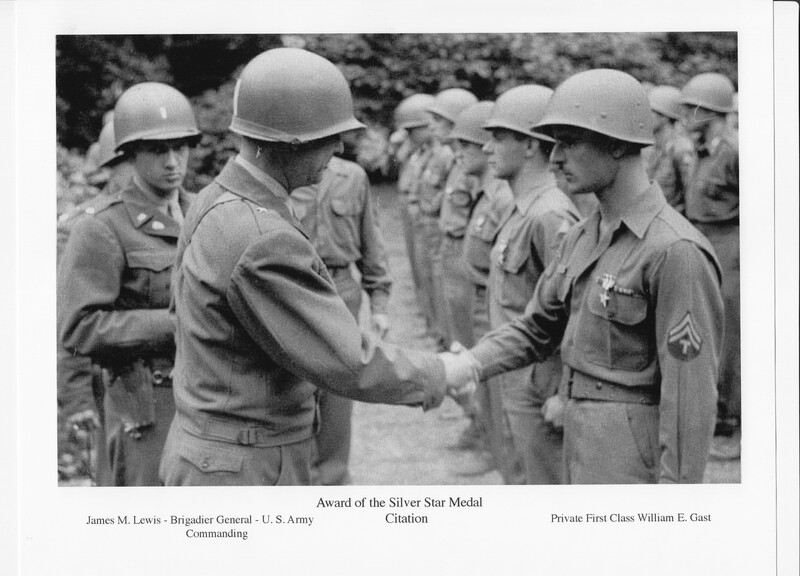 Well, late in the war, again a nice, beautiful April day—we were shooting like crazy across the top of Germany, and Major Benjamin of the 743rd was kind of out ahead scouting a little bit—he came back to the battalion and he pulled my tank and George Gross’s tank [fellow tank commander] out. He told us to go with him. So we did. ‘That was a nice, nice thing.’ Later, this will strike me as the under-statement of all time. Though we could not know it at that moment in the summer of 2001, a portal across time and space had just unlocked, and I would wind up stepping across the threshold; our lives and the lives of thousands of other people would be affected, for the better, and there was healing. 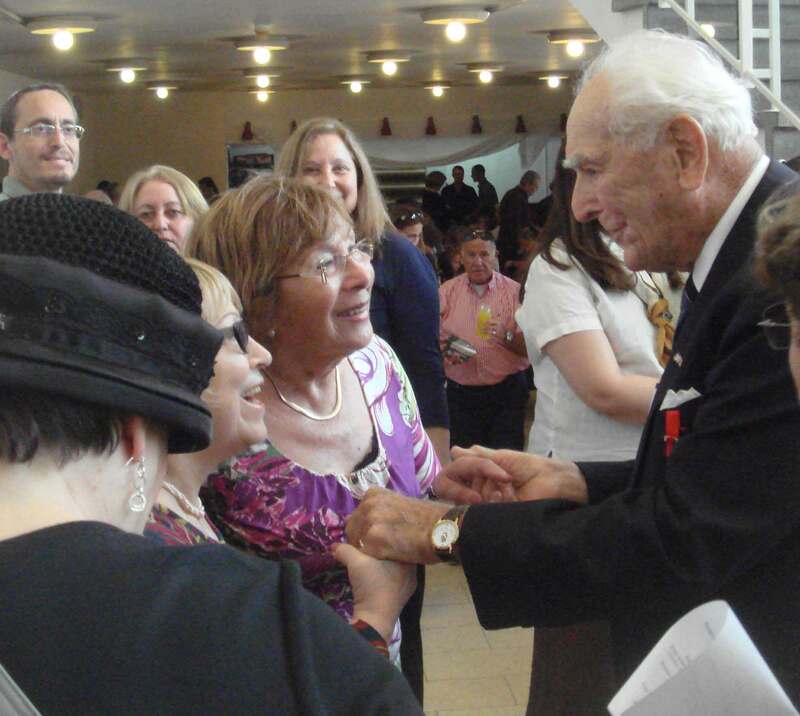 Ten years after that interview on Coleman Avenue in this village, I was invited to attend a special reunion in Rehovot, Israel, where liberator Frank Towers and I addressed an auditorium filled with fifty-five survivors of the ‘Train Near Magdeburg’ and their children and grandchildren. In the audience were over 500 people who probably would not have been born, had it not been for the actions of this soldier and the others. As we listened to the testimony, a woman began softly crying behind me. I kept my cool and bit my lip and didn’t cry until another survivor’s daughter approached me and told me that my name in Hebrew meant something along the lines of, ‘Mystery of God’. Heavy, heavy words. Yet here I was, halfway around the world, connecting people unknowingly bound together in the greatest crime in the history of the world. Watching families heal. We would have eleven reunions on three continents, the first right here in Hudson Falls. The ripples continue to reverberate; I still get emails expressing thanks and amazement from survivor families who come across my work anew. That’s not to say it’s all been an easy road. 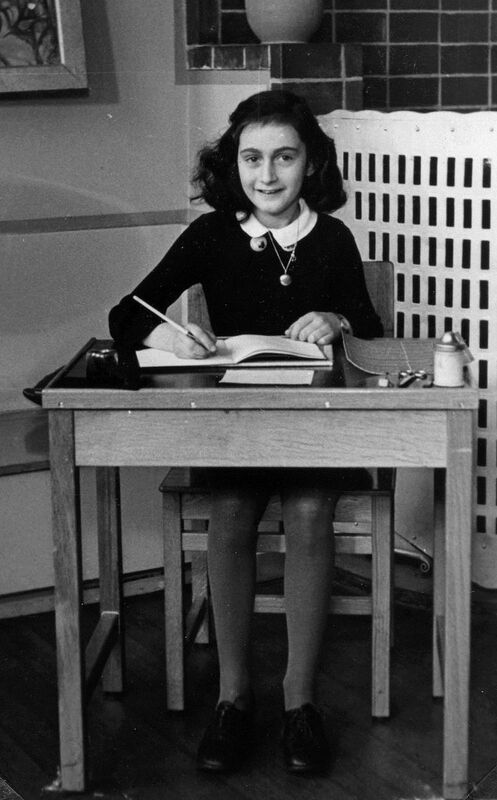 I had to become extremely conversant in the macro and micro aspects of the study of the Holocaust, and extremely proficient in the teaching of it (and there are a lot of ways to get it wrong). I’ve sat at the feet of the best instructors in the world, who helped me reach powerful insights, and gave me the tools to defend myself and to prepare my course of action when I come under attack by Holocaust deniers and minimizers. I recently left the classroom after more than 31 years, but with my fifth book due in a few weeks, I’m still busy honoring memory. 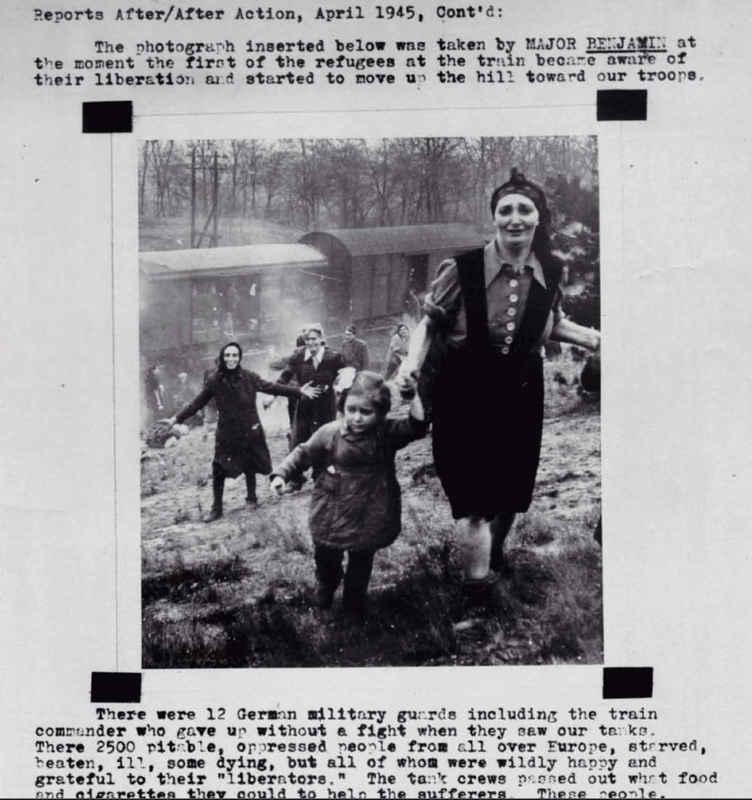 My dear mother and father, and many of the World War II veterans and Holocaust survivors I interviewed, are now gone. And so we come back to this tree. If you don’t know history, you don’t know anything. You are like the leaf that doesn’t know it is part of the tree. This tree commemorating my pilgrimage is an appropriate symbol, a gentle reminder to the young to be curious, to wonder, to hope, to dream, to take risks, to take advantage of the memory and knowledge of those who came before them. This tree symbolizes life, and its roots are anchored in memory. ‘Prosit’, the old man would say on occasion, invoking his schoolboy Latin. 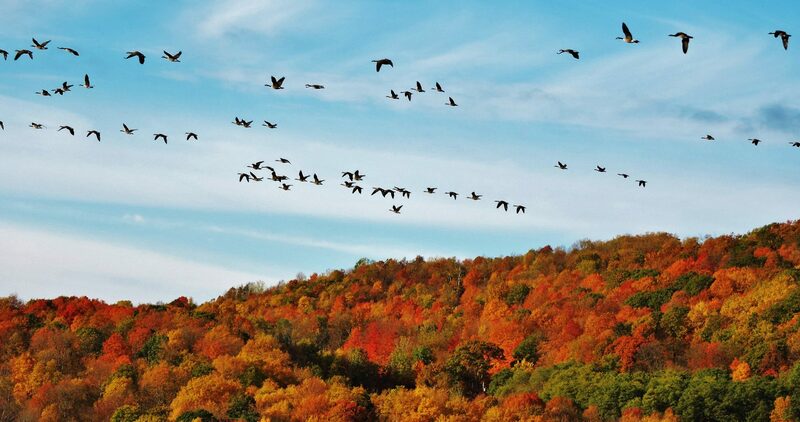 ‘So it is, and may it be to your advantage.’ As the breezes caress this maple’s leaves, in the rustling may you hear the whispers of those who came before us, those who like Miss Columbia inexorably called me home to attend to a life’s work. Now with this ‘remembering tree’ growing in her garden, may the ripples continue to go forth and ping the past, and may your fathers, and mothers, live forever. “Marker for special dedication ceremony ​to ​​honor Matthew Rozell​ on Sunday, May 27, 2018, at 1:00 p.m. at Juckett Park in downtown Hudson Falls. 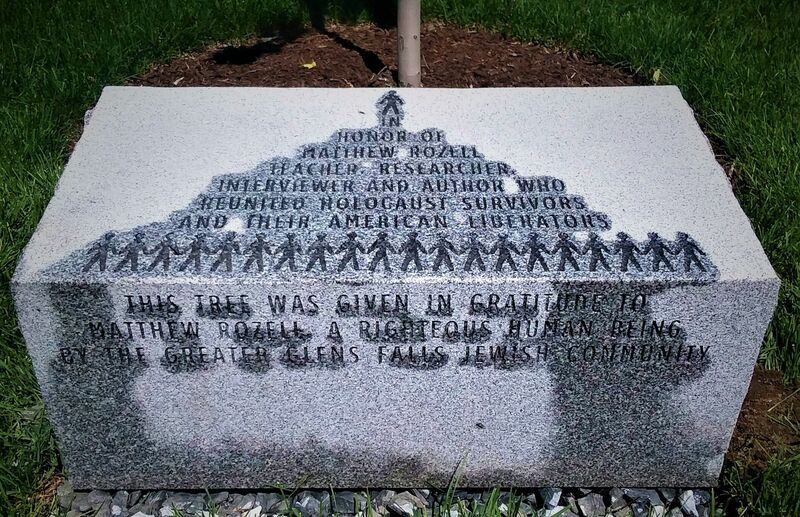 At this ceremony, ​we will dedicate ​the tree ​purchased by the Greater Glens Falls Jewish Community​ in recognition of Matt​ as a righteous human being​ for his work as a historian, teacher, Holocaust educator and author who reunited survivors and their American liberators. Through his teachings, writings and efforts, Matt has brought a greater awareness of the Holocaust not only to our community but also globally. Excerpted from my first book, The Things Our Fathers Saw—The Untold Stories of the World War II Generation From Hometown, USA-Volume I: Voices of the Pacific Theater. 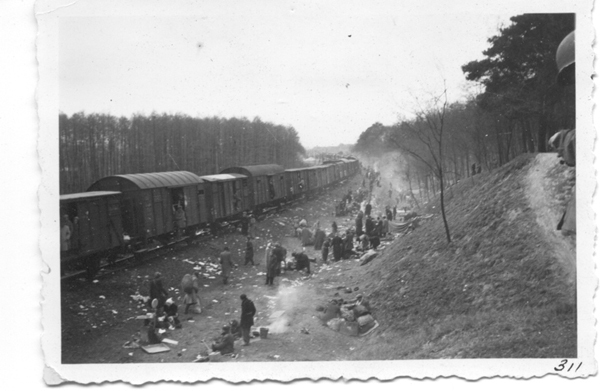 Excerpted from my second book, A Train Near Magdeburg: A Teacher’s Journey into the Holocaust, and the reuniting of the survivors and liberators, 70 years on. Expertly organized by survivor’s daughter and my friend, Varda Weisskopf. My dear friend and supporter Sunny Buchman spearheaded this effort. I stole this leaf/tree quote from Michael Crichton’s book, Timeline. [i] This is what Miss Columbia wanted me to find out, to try to understand—As a ‘soapbox’ aside, the teacher still in me has to add that learning all this is one of the reasons I find the I’m-a-rebel-on-a-new-bandwagon-and-in-your-face-if you-don’t-like-it display of the Stars and Bars locally both profane and contemptuous. Because here in the northern towns where your own great-great-great-grandfathers were from, fighting and dying in those far-off fields, never to return home, there is still something to be said about cracking a book and educating oneself, or not sleeping or texting thru history class… something important about REMEMBERING.